When I started this blog, my mom was not that surprised, because she has been telling me for years that I was obsessed with dresses even from a very young age. She enjoys telling me how, when I was little and in grade school, I absolutely, positively had to wear a dress to school every single day. Since we lived in Connecticut back then, dresses were not the ideal piece of clothing for a little girl to wear during the cold, snowy winters. 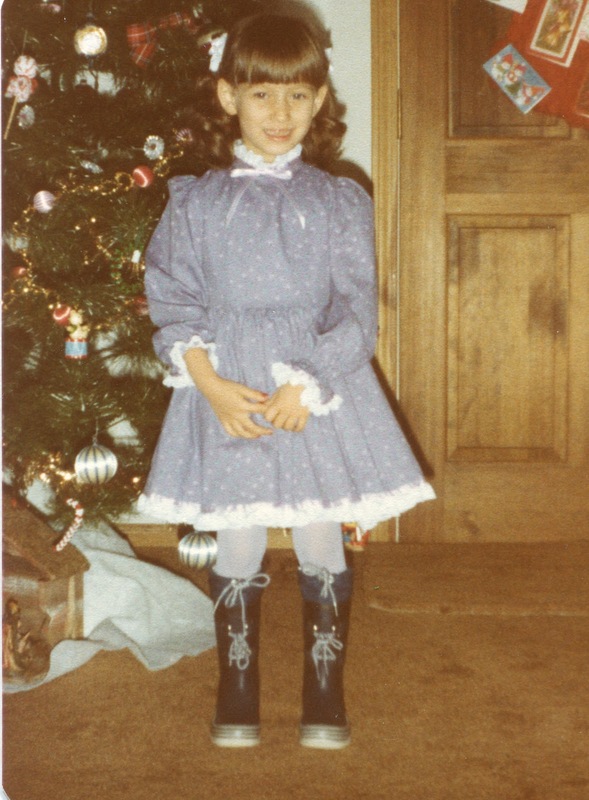 Although I of course insisted on wearing a dress, that didn't stop me from complaining that my legs were cold, so my mom would buy me thick tights and snow boots so I could get to school and still keep warm. She said, since she only had a few pairs of tights for me, she would have to wash them over and over so I could wear them again. She must have really loved me to go through all that aggravation. I love this picture, which I scanned in last night, because I think it perfectly encapsulates that little fashionista-in-training. I'm not sure how old I am here, maybe 5 or 6, but I guess I knew even then how much I loved a closet full of clothes.